Following their promotional appearances, some celebs stepped out for the 2019 CinemaCon Big Screen Achievement Awards at OMNIA Nightclub in Las Vegas yesterday evening(April 4th). 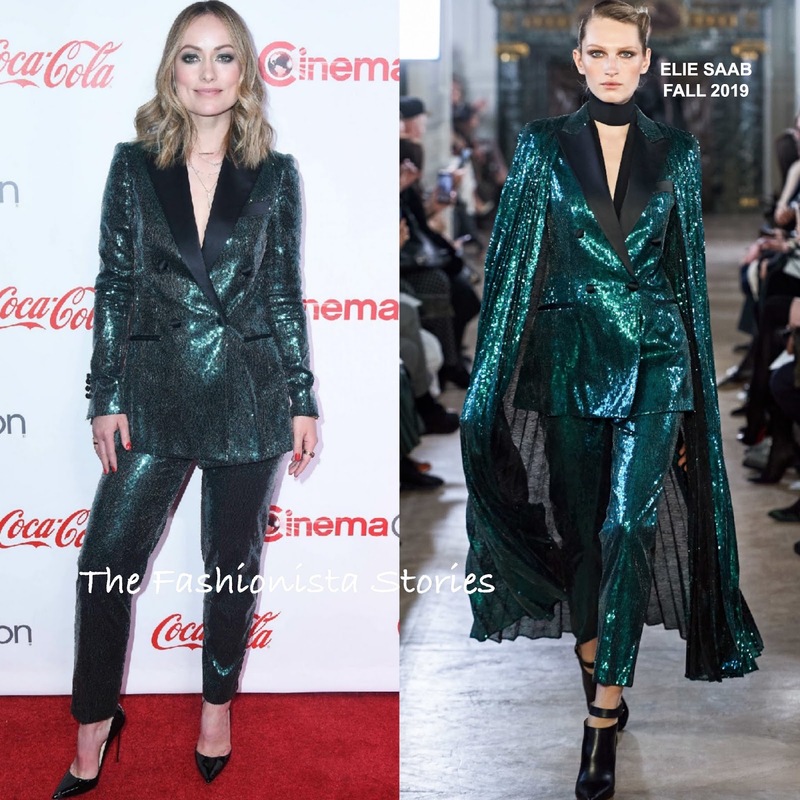 Olivia Wilde and so many women continue to go hard for the power suit and Olivia did not disappoint wearing the on-trend look courtesy of ELLE SAAB. Her FALL 2019 sherwood green & black trimmed sequin tuxedo blazer, was paired with the matching slim leg trouser. Beauty wise, center part light waves and smokey eyes rounded out her look, along with gold jewelry and black pumps. 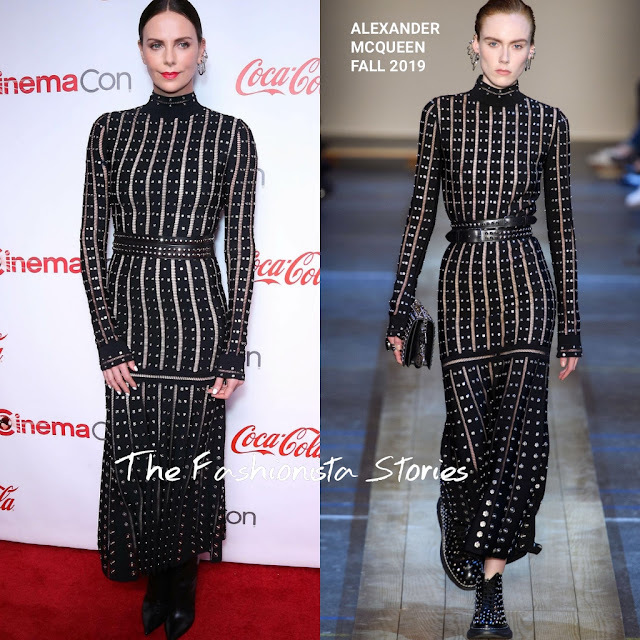 Charlize Theron went the sultry, edgy route, wearing a ALEXANDER MCQUEEN FALL 2019 black & silver spike long sleeve, lattice cutout dress, which was belted at the waist. Even though this is off-season but I do like it. Pumps would have looked great here but her JIMMY CHOO black boots worked as well. A selection is silver earrings, and a red lip rounded out her look. Katilyn Dever showed a little midriff & décolletage wearing a MIU MIU ensemble that featured an black ruffle & ruched off-the-shoulder crop top and a navy printed midi skirt. I kinda wish the top was white but she still looked cute. A complimentary beauty look and silver sandals rounded out her look. Mackenzie Davis chose a PACO RABANNE PRE-FALL 2019 ensemble which featured a blush pink embellished satin gown, with a printed logo top underneath. Accessorized with an EDIE PARKER clutch and white STELLA LUNA mules, she finished up with a complimentary beauty look.